This has been a huge hurtle for me to conquer. It appears that most builders just leave the edge of the sides, to which the soundboard will be glued, flat. And, perhaps for good reason. 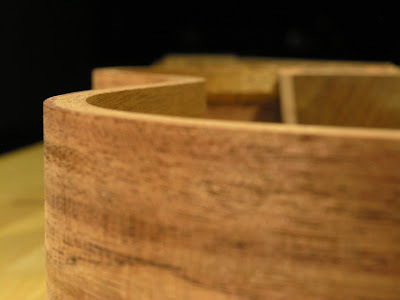 But, while some argue that it is preferable to build in a little bit of tension into the soundboard, and mating a domed top to a flat gluing surface would definitely do that, I was determined to try and fit this the best I could and thus bevel the edge. I started by drawing an elaborated version of Rik Middleton's string height diagram featured in his book. 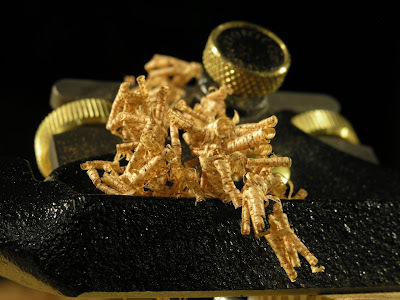 I found it a very helpful guide to visualize how different parameters, such top doming and neck angle, would impact the final setup of the guitar. 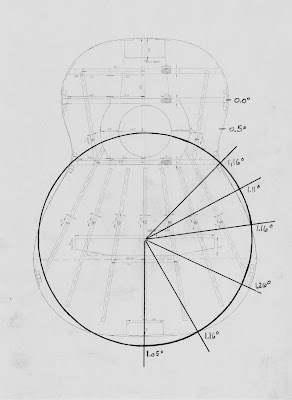 Initially, it was my intent to have a 25' radius dome in the soundboard that tapered off linearly above the lower transverse brace, forming a kind of tear drop shape, but from Middleton's diagram it became obvious that this wouldn't as easy to do as just that. I started to experiment with alternative scenarios such as having the lower transverse brace arched more to create a more elliptical shaped dome, another version had all the transverse braces flat, and so on and so forth. 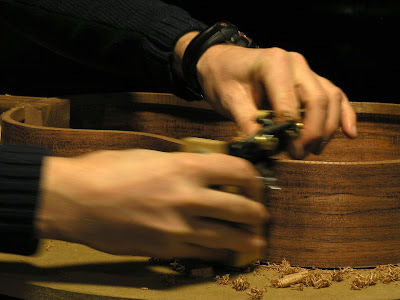 Through a lengthy correspondence with two of my luthier buddies, Udi Vachternman and William Londree, I ended up deciding on a more traditional solution where basically everything below the soundhole will be domed to a 25' radius and everything above it will be flat. With all this, I also settled on a neck angle where the nut is raised 1.5mm. This will give a string height of 3.4mm with a 3.0mm saddle sticking out of the bridge. These numbers are of course theoretical as some distortion is likely to take place once the strings are on and tuned up to pitch, but it should hopefully be in the right ballpark. 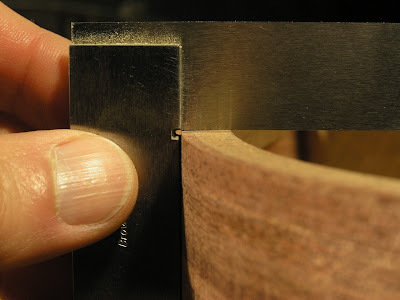 I had a friend from work help me out with calculating the right angle for the bevel in various places on the rim. Measured with the center of the dome at the saddleI, it came up somewhere in between 1.05º and 1.26º, changing with the undulating shape of the lower bout. As it was not practical for me to work closer than a 0.5º proximity, I decided to settle on 1.0º for all of the lower bout and tapering to flat between the lower transverse brace and the next one up. 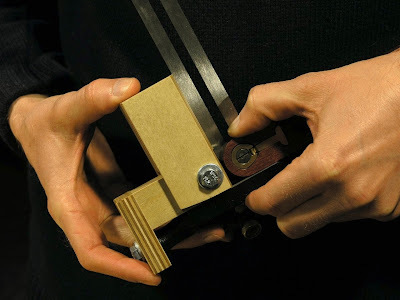 To do this, I constructed a little fence jig to hold a spokeshave. It's a simple little thing that consists of a base that functions as a fence and a little tilting shelf that holds the tool. 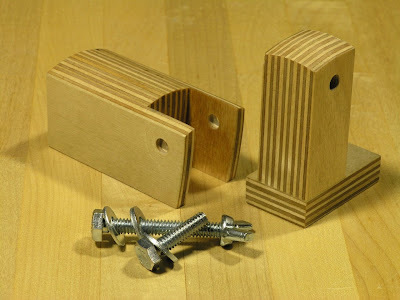 The shelf has a rare earth magnet that anchors the tool down and at the end a bolt replaces one of the tool handles and locks it in place. In future I might alter it a little by adding a slice of veneer over the magnet to protect the blade and rework the shelf part so the jig can be used both left and right - at the moment it only goes one way. The spokeshave was set up to cut as fine shaving as possible, the right handle was screwed off and the spokeshave was fastened to the jig. 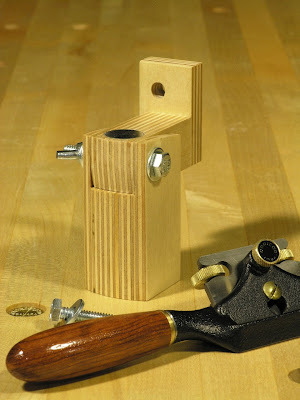 I set my sliding bevel to 1º and transferred that angle to the jig and was ready to go. 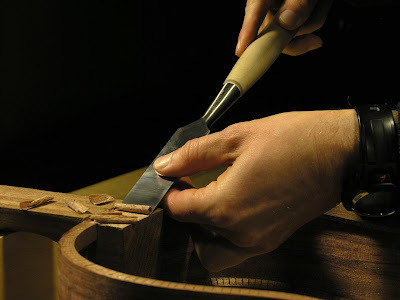 First the guitar was fastened to the bench by resting the body on the 15' dish the back rim was fitted to. A support for the neck was built up with some MDF and other scrap and the hole thing was secured with two clamps, one at the top of the neck and one at the end block. 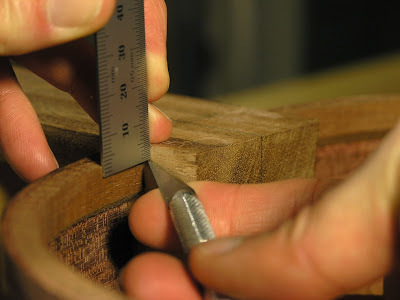 Cutting the bevel was quite straight forward. The only thing I really had to concentrate on was to keep the fence flat up against the sides while working my way through the job. Once the kerfing got down close to the actual side, I lowered my work light so it was virtually level with the rim. This revealed all the areas where the kerfing wasn't cut down far enough by casting a little shadow on to the edge of the sides and allowed me to monitor quite closely where more shaving was needed and where it wasn't. When I got to the endblock, I repositioned the clamp slightly off to one side, worked the endblock area down, moved the clamp back again and continued on the other half. Once the whole rim was done this way, I reset the jig to 0.5º and worked the area from the lower transverse brace and up, trying to gradually work the shallower angle in. 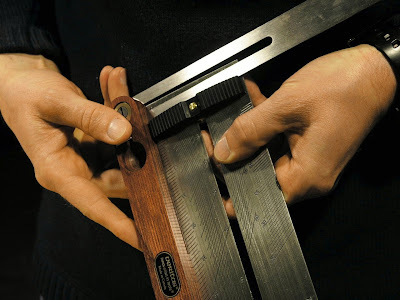 The same was done with jig set to a flat angle, though this taper was gradually added, starting halfway between the upper and lower transverse brace. The last few inches near the heel I couldn't get to with the spokeshave was pared away with a chisel. Since the neck will be set at an angle to the soundboard, I've also been debating whether to cut the rebate to compensate for this or just do it parallel to the neck. My first instinct was to compensate for the neck angle. However, I decided to compensate by angeling the fingerboard graft on the soundboard instead, once the soundboard is ready to go on. I started by marking the heel 3.5mm down from the edge with a scalpel all the way around. Ready to pare away. Cumpiano's method of making the rebate is similar to the way he cleans out waste inside the head slots - by first paring the waste down to the marking while leaving a peak in the middle and then slowly taking the peak down to a flat, a method I really like when I did my head slots. But, this proved to be a real chore as the already attached sides got in the way big time. 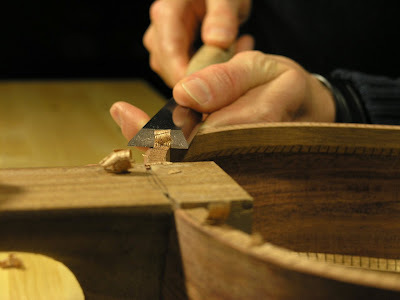 Instead I had to work my way through the task in a quite random manner, using both sides of the chisel, paring sideways from the center and out and from the end and in towards the side joint. It was a real pain in the neck to say the least. But down it went. Since this is my first build and I have gone a little astray from tradition, I have to ask myself if this was the right thing to do, and to be honest I don't really know. I was surprised to see how little an angle was needed to fit the 25' soundboard dome and since I ended up rounding the correct bevel up to the nearest 0.5º it wasn't accurate anyway. 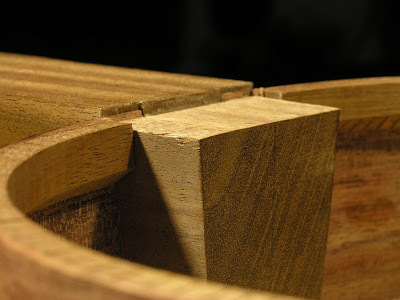 Another caveat was that it was difficult to monitor whether the rim ended up on a perfectly flat plane - that some parts of the sides ended up being cut deeper than others. For this I mainly had to rely on my hope that the side were flat already and all I had to do was to cut the kerfing down to match it. I don't know if this is easier to achieve by sanding the whole side on a flat sanding board prior to installing it, as it is normally done. To me, it seems that it might be just as difficult to sand a loose and floppy side evenly along it's length, but I don't know. So the question remains whether this effort had any value at all or if I was just being another newbie trying to reinvent the wheel. One thing is for sure though, it made me go places and read up on things I would have if I had just followed instructions and as always it was fun to do the research and think it all through. That and cut the heel rebate before the sides go on!! !